For better or worse, the onus is now on movements to be as bold as ever, and tell a more compelling story than any born of bureaucratic jargon. This week, an estimated 40,000 people have descended on Paris for the 21st Conference of Parties, or COP21, a gathering of world leaders, civil society organizations and bureaucrats that will attempt to hash out the details of an international agreement on climate change. The nearly 140 diplomats converging in the French capital’s outskirts are bringing their own national commitments, with eyes on top polluters from the United States, China, Canada and India to adopt hearty, binding resolutions. On the table are a number of different scenarios, none of them a quick-fix for worsening storms. Grassroots movements, Global South nations and indigenous groups have coalesced around the demand for a 1.5 degrees Celsius cap on emissions. “That’s what our appeal is,” Tuvalu Prime Minister Enele Sosene Sopoaga said in his opening remarks yesterday, “simply to ask that the future of our children be assured.” But, as journalist Mark Hertsgaard pointed out in The Nation, even a best-case scenario — in which countries integrate their predetermined pledges — will still increase temperatures anywhere between 2.7 to 3.5 degrees Celsius. After 25 years of botched COPs, Chinese President Xi Jinping’s assertion that this month’s talks are a “new starting point” comes with a sting. Well before the close of day one yesterday, many commentators had already stuck a pre-emptive fork in COP21. But is the best we can hope for from Paris really only a pyrrhic victory? The talks are also happening just weeks after the deadly November 13 attacks on the same city that claimed 130 lives. French legislators have extended the state of emergency President Francois Hollande declared in its aftermath, giving police free reign to act without judicial oversight — and block dissent. While more than 2,000 homes have been raided under state of emergency provisions, 24 climate organizers have been preemptively placed under house arrest and 120,000 French police have been deployed around the country. All “outside events” and public demonstrations have been banned, including the Global Climate March that had been planned for last Sunday. The ban means that we’re likely to see an increased focus on events happening outside of conference rooms, even if there are likely to be less of them. Defying Hollande’s protest prohibition, as many have already done, could leave movements in the position of presenting a more hopeful and ambitious vision of the future than any likely to emerge from official proceedings. But entrusting faith in the people outside La Bourget doesn’t mean giving negotiators license to walk away without a clear plan; the stakes — especially for those already suffering from drought and displacement — are much too high for that. It means being realistic about what can be reasonably expected to happen in the next two weeks, and making sure negotiators know that — in Paris and when they get home — they’ll have to answer to a militant, global movement that can ramp up pressure locally, and extends well beyond one nation’s borders, however militarized. Many came to Paris with the intention to do just that. Kicking-off this week’s talks, a record-breaking 775,000 people marched in some 175 countries on Sunday. Indigenous groups held a small healing ceremony in solidarity with victims of both recent terrorist attacks and the ongoing tragedy of climate change. 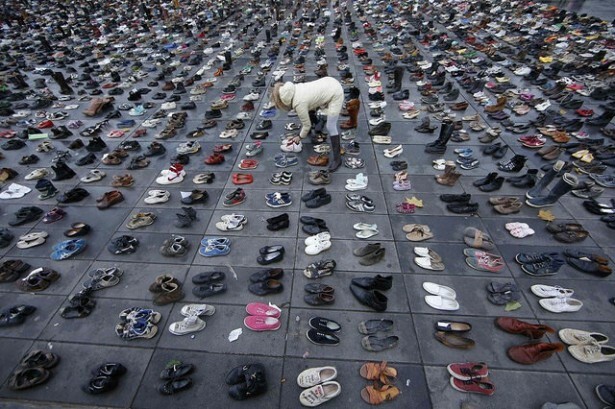 More than 10,000 took part in a human chain spanning the three-kilometer march route, and 11,000 donated shoes and messages in defiance of the state-imposed ban on protests. By the end of the day, an estimated 280 people had been placed in police custody. The question and answer alike are absurd, but highlight an important point about what’s at stake these next two weeks: Who gets to frame what happens in Paris, in the streets or around the negotiating table? A metric that might be every bit as critical as how many parts per million countries keep out of the atmosphere is how much faith people place in movements — the people who will make sure anything that happens at La Bourget is worth a damn after diplomats fly home. Declaring an early defeat leaves room for little apart from nihilism. Investing too much hope in the COP’s flawed process, on the other hand, threatens to repeat the post-failure “climate trauma” that trailed the collapse of talks in Denmark in 2009. What happens in Paris matters. What happens afterward is every bit as important. For better or for worse, the onus now is on movements to be as bold, defiant and creative as ever, and tell a more compelling story than any born of bureaucratic jargon. Coalition Climate 21, comprised of some 130 groups from around the world, the Climate Games, and a host of other organizations will be planning ongoing protests throughout the week. The Climate Action Zone, in the Centquatre-Paris, promises to be a hub of activity in the lead-up to D12, a day of mobilization to close out the talks and a renewed intention to target fossil fuel infrastructure and extraction the world over. As we’ve seen these past few months in the United States, the only leadership our government has displayed on climate has been a result of movements making business as usual harder to conduct. There was no magical change of heart, after all, that took Obama’s administration from advocating an “all of the above” energy policy last May to rejecting both the Keystone XL pipeline and Shell’s arctic drilling exploration in recent months. While there are plenty of policies and backroom politics to be analyzed over the next two weeks, what matters more is what’s being done outside the conference rooms, where demands that actually meet the crisis at hand are being made. 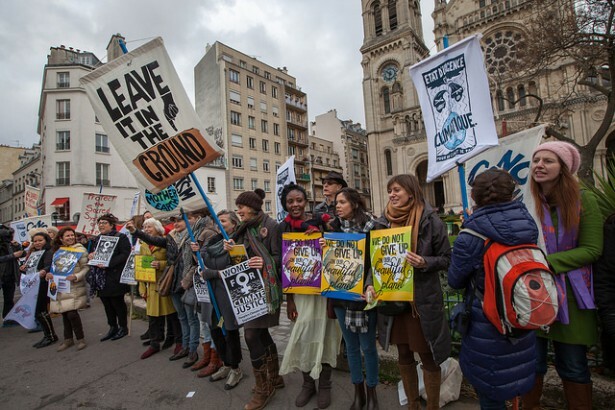 As with the French workers’ uprising in 1968, the beauty at COP21 is in the street.